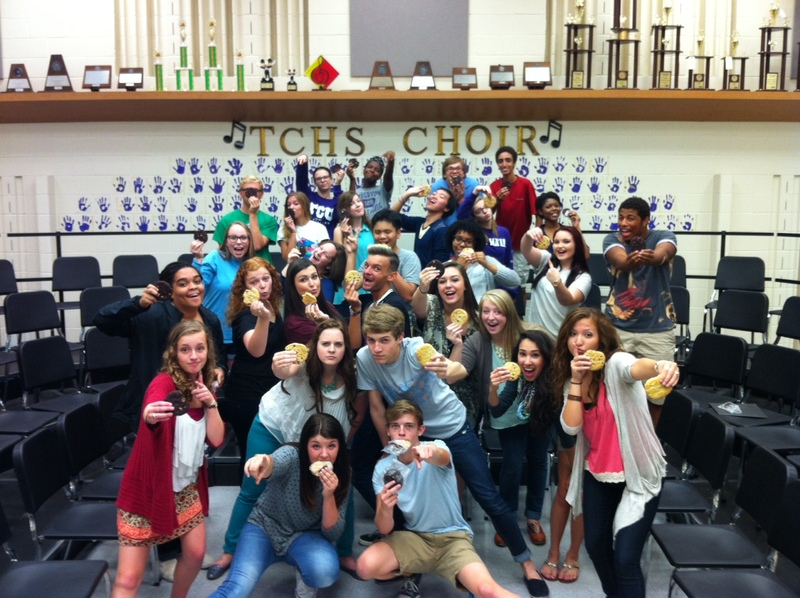 TCHS Choir members show off some of the cookies for sale each Friday. Various Timber Creek groups are staffing snacking locations throughout the week, offering Falcons sweet treats and other nibbles during lunches. All snacks are available outside the Fine Arts Center at the concession stand or box office. Mondays – Wooley’s Frozen Custard is available at the concession stand in front of the Fine Arts Center. Tuesdays – Chick-fil-A chicken sandwiches are available for $4 each. Cash and cards are accepted. Proceeds benefit the THCS Theatre department. Wednesdays – Popcorn is offered at the TCHS Box Office outside the Fine Arts Center for $1 per bag. Only cash is accepted. Proceeds benefit the Timber Creek Library. Fridays – Fresh baked Otis Spunkmeyer cookies are available for $1 each on Fridays. Varieties of cookies include chocolate chip, double chocolate with white chips, and sugar cookies. Proceeds benefit the TCHS Choir programs.